This entry was posted on January 16, 2007 at 7:57 am and is filed under Nido Generation. You can follow any responses to this entry through the RSS 2.0 feed. You can leave a response, or trackback from your own site. Great blog! I welcome the insight into Bahrain’s version of generation “Y”. Yeah the nidoers are a world wide phenomena nowadays. I’m sure they’re not limited to Bahrain. So is this “chicken nuggets” term widely used in Kuwait to describe them? It’s been widely in use since the 1990s, and is quite degratory(sp), although some chicken nuggets embrace the label blithly. Thanks for these observations. I’ve seen the nido species all over Bahrain (MUN, Hapkido lessons, English essay competitions etc) and even among natives and expatriates in places like Saudi and Emirates. I’ve seen them in Jordan (where their favorite haunt is Abdoun Roundabout and they’re sometimes called “tants”). What galls me most about these people is their un-originality, and that despite all their outward gloss, they’re reall quite conventional on the inside; and most of them (you’re an expection) dont even realize their predicament. I’ve always said that there are no real aristocrats in the Gulf and the Nidos prove that. I myself am sometimes mistaken for a nido-er, though in reality I’m just stuck in a no-man’s land, somewhere in middle-class wasteland, because of certain specifics of my history. Ahh yes… Abdoun Roundabout, that world reknowned area for nidoing. Sounds like you’ve been to the hangouts that I’ve been mostly to before! Then again, I guess all people in a nido environment go to the same places! Kudos to you for coming up with an iconic symbol to signify Bahrain’s new generation riche. I’m also glad you stayed away from the class issue, it doesn’t seem to me as mentioned above, that you can classify a nidoer as bourgoise, aristocrat, nobles or upper class in the ‘english’ sense, and maybe there is no need to apply such a classification. I don’t know if you have heard of the ‘tesco’ generation – Tesco was once a low-cost supermarket for the working class in the 70s, and as the UK economic tide rose, old consumer’s became middle-class and hav made Tesco the UKs biggest supermarket chain. The nidoer, is much more Americanised in nature; society is based on wealth. Your value is derived from the consumer brands that adourn you and consumer advertising drives you needs and desires. and watching them have one of the seizures u describe however I’ve never been too popular with nidoers to take the conversation even this far if it were possible. Religion is so un-nido-esque, the aversion to hijab and most religious practises is accompanied with, “you are kidding me right, i’ve only seen my grandmother do that”. On the macro level, if we take the nidoers to be the bourgoisie in the old marxist sense, then these individual traits translate into an entire section of society moving from the collectivist, “we, us” to the individualistic, “I” and the winds of social change will definitely not come from such spiritless powder milk guzzlers! Good blog, keep up the study of nidoism though I suspect most of the specimens in question are in their ‘check me out’ haunts or having a manicure, i’m happy a few nido refuseniks hav found their critical voices online. The “new” generation as you are describing it is confined to a very limited number of people that you are probably interacting with. Bahrania: Wooow! That’s a long and deep comment. Let’s see what snippets I can reply to in my half dazed state. I definitely think class is seriously involved in the issue. By class I don’t mean the English meaning of class. Where you have a posh guy who speaks a certain manner and wears certain clothes and “low classes” eating certain things, wearing certain clothes, and talking in a certain accent. That however is definitely part of it. I’m more interested in class in teh economic sense and the “superstucture” that is built around it. Whether we like it in Bahrain rich people definitely have a different outlook, mode of thought, way of life, and relationship to poor people. Of course this doesn’t go across the board but it exists. Bahrain has also the situation of emerging from a pretty class-less society, so remnants of that old environment still remains. But more and more the two classes are being isolated. I agree with the rest of what you said but I’m unsure of the last comment on the bourgeoise in the marxist sense and the prevalence of “I” and individualism. I mean isn’t that often the case even before? I don’t think the bourgeouise before were in a massive conspiracy scheming and contriving the whole time on how to put the poor scheming to put down the poor (although their actions from the outside might look like that). It’s just how a capitalist system works. Everyone follows his own interest but if one takes a a view of society from outside there are obviously different classes with conflicting views and goals, even if the agents themselves subjectively might not view it that way! Anyway, my eyes are hallucinating at this moment, I should shut up. I’m glad that you don’t fit the nido “stereotype”. However there are lots of other people in Bahrain that have serious nido traits. Obviously not many people fit exactly every stereotype I mention here, but remember that I’m writing a blog here adn not a serious academic text book. If you’ve failed to notice many nidoers before I suggest you visit Trader Vic’s, Mirai or any of the many investment banks in Bahrain! Obviously the vast majority of people in Bahrain are not nidoers, but a good chunk of the rich are! P.S. Nidoers most probably do not drink Nido! They’d probably drink Danone or something like that. What do you mean hiba? Do you want the arabic ad for nido? The one with the song? ka-ka-sh-ka 1601112 Description of melody thornton. Im fairly new to this blog and as I can now define myself as a nido-er im going to vent my long pent up frustrations here! For the first 18 years of my life I lived in Bahrain and was a glorified nido-er. I went to private school, drove around in fancy cars, never uttered more than two words in Arabic and couldnt wait to graduate and study in the UK as I felt I was far more western than I was Arab (I was especially smug as I have an English mother which seemed to validate my westerness at the time more so than my wholly Arab friends!) So for 18 years I lived in the nido bubble and was very happy. The problems began when I did graduate and came to the UK. To say that I hated it would be putting it mildly – the people, the weather, the food – basically the country itself. I even started hating my mother for being English and for forcing her ‘englishness’ on me by making me study here (this hatred has now dissolved to a mild dislike!). What followed was 5 years of isolation because I refused to mix with the locals and there werent any Arabs that I knew with me. During this time I began to really connect with my roots and discovered that I wasnt nearly as western as I thought and am entirely Arab. So here I am – definately not English, not entirely Arab and suffering from a severe identity crisis! So I would like to thank you for giving me the title of ‘nido-er’ .. it may not be something to be proud of it but atleast its a start! Ill save the problems of how Im not a snob anymore and head to Abraj rather than Trader Vics when I get home for another time – Im not ready to renounce my nido-ness yet! Man i just love your blog, keep the cool posts comin.. I doubt whether this site/blog is still funtional but I couldn’t pass up the opportunity to offer my two cents worth. The deal is I work at an ad agency doing a campaign for Nido and I was just trawling the net looking for info when I stumbled upon these entries. I must say I’m nothing less than gob-smacked /dumb-struck / flabagasted at the similarities of your issues to ours. I’m a black South African (yall probably don’t know abt us right! we’re on the other side of the world) Yet we’re also grappling with the very same identity issues. Our version of Nidoers here are Coconuts (Black on the outside and white on the inside) This is newly financially empowered – post apartheid/segregation generation (yes myself included) is also referred to as the Black Diamonds ; Born at the right time generation. They (we) also posses the uncanningly identical characteristics to your Nidoers (The priviledged lifestyles; private school education; American influence; the preferance for English versus vernacular/ native languages and just general – all out apathy for most things native) It’s frightening. The beauty about growing up though is the ability to question life (for some) and see it for the lunacy it can be and hence make the appropriate choices. So nice work on this artickle, you’ve just proven once again that nothing in this world occurs in isolation, that one country’s issues are most likely to be world issues, and the butterfly effect is not just a Movie with Ashton Kutcher or a myth, good work &…God Bless Ya! Good to know that Arabs are finally trying to find their own identity at least. God! knows you’ve all helped build up the Americas and Europe at the cost of your own countries and other Muslim nations. This Nido even so far as to park himself in the Safeway aisle. I’m very impressed with your insights and encourage you to keep writing. In other words, ” I feel you!!!”. Bahrania was right about the “icon”; I declare Nido to Bahrainis what Campbell’s is to Americans, and you, my friend are blogging’s Andy Warhol. I gotta say this is one of the coolest comments to ever grace this blog. Thanks a million man! P.S. And where have you disappeared from blogging? I do not understand you, in the sense that you seem to be bitter of your own kind, I’m sorry I do not read your blog but I support you on one thing though, which is the fact that a nido-er will not listen or appreciate any form of Arabic art. but wait a minute have heard or seen much good Arabic art lately ? Marcel Khalife is equal to Nancy to a nido-er but is it to you too? Some are over rated and some are under rated, who drums louder is the one who gets heard , no matter how bad he drums. man chill it is simply because the world is changing we have nido-ers lol. anyway you have a good one (whatever you are doing). I’d love to talk with you correspond with you, really! For god’s sake people! Give us a break . . .
Do you think its about “cool” that the Nedo-ers are a western-ized? We do not praise the west (north American or European), it is just they have proven to be the most effecient and productive people. And to be truthful. I’m ashamed to be an Arab after we lost everything “Arab” word stand for! We were famous for having qualities we have lost. Arabic Art, Music, and lifestyle have their own audience. Not me, I prefer Metallica, Opeth, Burgers, Jeans, Classic American Cars, and a british accent. I think what you’re referring to in your rant is globalization… or in other words, the metamorphisis that any number of teens from any number of countries go through… they all become American. I discovered this product years ago in the grocery store. Glad I found a place to purchase it again! I used it in place of powdered fake creamers in my coffee and tea. 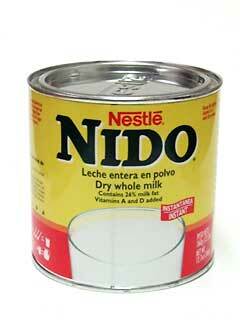 I also used it when I ran out of fresh milk. Makes great hot cocoa too. Way better than regular powdered milk and those coffee creamers! I myself have been brought up in a private school and studied at western universities, and naturally English has become my first language. “youth of the upper-middle class, mostly educated in private schools and universities”, correct, however I would not label myself a ‘nido-er’ since I do not fit some of the characteristics mentioned as such. Being educated in a western society has not affected me much after studying Islamic sciences, which gave me the ability to differentiate between good and evil and allowed me to live a righteous life. I have been able to mould myself to become productive, intellectual, knowledgeable while living a modern lifestyle without sacrificing my religious consciousness. Yes, I do wear jeans, however I do not believe education is to blame if you are able to take the good from it. Instead, use it wisely as a tool to help yourself and others. I would like other western-educated Bahrainis to be ‘SELECTIVE’ and not implement unislamic and corrupt ideas into their mentality and lifestyle. Arabic is one of the most important, if not the most important, languages in the world. But remember you do not have to be an ‘Arab’ to be a good person. Interesting. To be sure there are similar groups from other countries as well. An all suffering the same ailment. So far, this is the best description expression that I have read. Keep it up! For non Arab readers it would be interesting to have some information of what it is that the Bahrainis have abandoned in favour of the new “culture” which they have adopted. It’s clear that you are not too keen on “Nidoism”. But what is it that you would rather they become? When a modern-day couple decides to discover through past life regression if their lives were linked in the past, a passionate 1930s love story emerges….